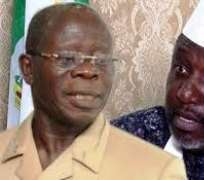 As The Verbal War Intensifies, Gov Rochas Okorocha Declares" "Oshiomhole Is The Father Of Familiocracy"
Governor Rochas Okorocha of Imo State as again slammed the party’s National Chairman, Adams Oshiomhole, accusing him of nepotism. But Okorocha reacted to this charge of nepotism in a statement by his Chief Press Secretary, Mr. Sam Onwuemeodo, and said it was Oshiomhole that was the “father of nepotism,” accusing him of promoting his relations into several political offices in Edo State. “But Oshiomhole is the known family dynasty builder. And Edo State is the victim. In fact, he is the architect of “familiocracy”. Oshiomhole is the National Chairman of APC and governor for eight years. Rilwan Oshiomhole, his younger brother, is a Commissioner in Edo State Oil Producing Development Commission (EDSOPEDEC). “Seid Aliyu Oshiomhole, another younger brother, is the House of Assembly candidate for Etsako West 2 State Constituency. Yakubu Oshiomhole is the Secretary to the Local Government Commission; Dr. Cyril Adams Oshiomhole is vying for the House of Representatives for Etsako Federal Constituency.